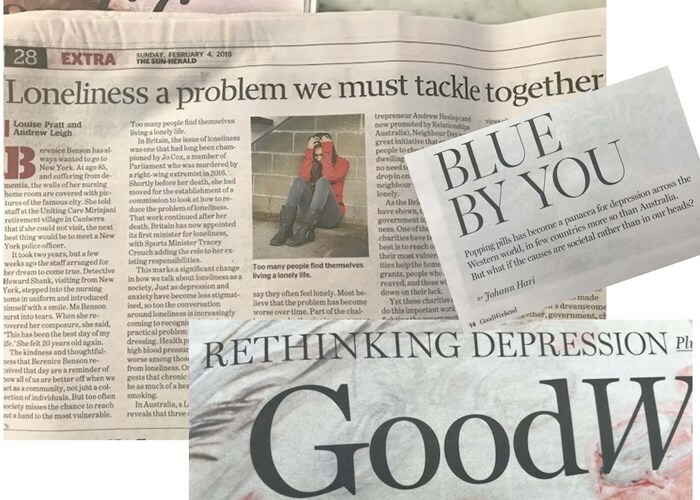 It has been interesting to read recent newspaper articles highlighting the causes and treatment of certain people suffering from depression. All articles refer to the absence of healthy supportive social connections as a significant contributing factor for many people who are being treated for depression. Loneliness is a desperate and agonising plight often affecting older people in particular who are less mobile and isolated and cut off from supportive networks and family. When older and ageing people want to remain part of the day to day activities of society, should we question the relevance of building dedicated gated secure apartments or houses exclusively for older residents? What do ‘Retirement Communities’ give to society as a whole? The borders and barriers around Retirement Communities are in fact those actual constraints that define “Retirement Living”. The separation from mainstream society, are where older people are assigned to a homogenous generational environment with the same age group. This is what establishes a boundary between ‘us’ and ‘them’. This notion of a boundary is then reinforced physically with fences and gates and security, that literally builds the divide between old people and the rest of the world. Is this right? On a day to day basis we see co-generational communities naturally occurring in social places like shopping centres, libraries, parks, museums and galleries and restaurants and cafes. Would it make sense to mix up ‘housing suitable for ageing people’ with normal everyday housing for all and forget about separate ‘seniors housing’ on large scales and estates? The modern world has an urgent need to label and categorise roles and age groups and rules which result in increasing the separation of generational groups. If communities happen naturally without rules around separation, safety and security, what happens to the old people? The reality is that the natural communities of co- generational living have changed. People is today’s society are busier than ever before. They are compromised by the cost of city living, have small city homes, relocate to different cities and are increasingly made up of single and fractured families who are time poor. The family that older people used to take comfort in having around and relying on for care and companionship is often absent or distracted with their own lives. Aged communities have one thing in common – each other. Friendships and relationships develop in retirement communities where neighbours and new companions become like a new family. By looking out for one another they are in a position to understand the complexities of ageing but most of all, they have the time to be available for one another. The idea of putting one group of society together who are elderly, might not after all be a bad one. The comfort of having neighbours who can take an interest, or the knowledge of knowing one is included in a community give people a valuable sense of belonging and recognition. We are continually learning from our experiences of seeing successful and sometimes less successful projects develop and get used, but there is delight in witnessing older communities share companionship in their everyday life that motivates us to do more of what we do. “Ageing in just another word for living”. Cindy Joseph.